Naan is the Indian flatbread we all love to order when we eat out; in restaurants it’s cooked in a tandoor oven and comes to the table all puffed up and beautifully charred. Naan also can be cooked on the stove-top, making this bread completely doable at home. Flavorings such as garlic or onions can be cooked into naan, or the naan can be stuffed, as we do here, upping its deliciousness and turning this bread into a substantial side. Serve it as part of the Eclectic Ethnic menu or the Asian Fusion menu . POUR ¼ cup hot water in to a medium bowl. When the water registers 110°F on an instant-read thermometer, stir in the sugar and yeast and let rest for 10 minutes. IN a large bowl, combine the flour and kosher salt. Whisk together the yogurt and 1 tablespoon of melted butter and add it to the yeast mixture. Stir the yeast mixture into the flour and work with your hands until the dough comes together. It’s okay if the dough is a bit floury and dry; it will moisten and smooth out when you knead it. TURN the dough out onto work surface and knead the dough 5 minutes, adding a dusting of flour if the dough begins sticking to the board. The dough should be smooth. Place it in a bowl, cover with plastic wrap, and set on a warm plate for 90 minutes. 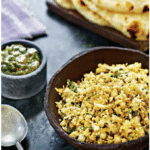 WHILE the dough is rising, make the cauliflower filling and the cilantro chutney. HEAT olive oil in a medium skillet fitted with a lid over medium heat. Add onion, green chilies, and grated ginger and cook 2–3 minutes until the vegetables begin to soften. Add amchur, cumin, garam masala, and turmeric and cook another 2 minutes until very aromatic. Stir in the cauliflower, tossing to coat, then add ¼ cup water. Cover the pan and simmer, stirring occasionally, until the cauliflower is tender, about 10 minutes. Stir in the cilantro, season with salt and pepper, and remove from the heat. USING the side of a chef’s knife, smash the garlic and chili with a pinch of kosher salt to form a paste. IN the bowl of a small food processor or blender, combine the garlic chili paste, cilantro, lime juice, and water and blend until combined. Pour the olive oil into the cilantro in a steady steam and process until the mixture comes together and is smooth. Season to taste with salt and pepper and set aside. DIVIDE the dough into 6 sections. Working with one piece at a time, roll the dough out on a lightly floured board until you have a 5-inch circle. Place 1½ tablespoons cauliflower in the center of the circle. Bring the dough up around the filling and press the edges together to seal. Gently roll the dough out again in an oval or round shape about ¼-inch thick. HEAT a nonstick skillet over medium high heat. Working in batches, brown the dough on both sides, 1 ½ minutes per side, until golden and cooked through. REMOVE from the pan, brush with melted butter, and sprinkle with coarse sea salt. Slice in quarters and serve with chutney.